Many Trump supporters and even independent voters have been tracking the continuing onslaught of severe misinformation being sewn by the media in an ongoing effort to disparage and weaken President Trump. However, now, the media's inattentiveness to detail has spread to even a few insubordinate members of the president's cabinet, and the effect has been nothing less than daunting if not shameful. 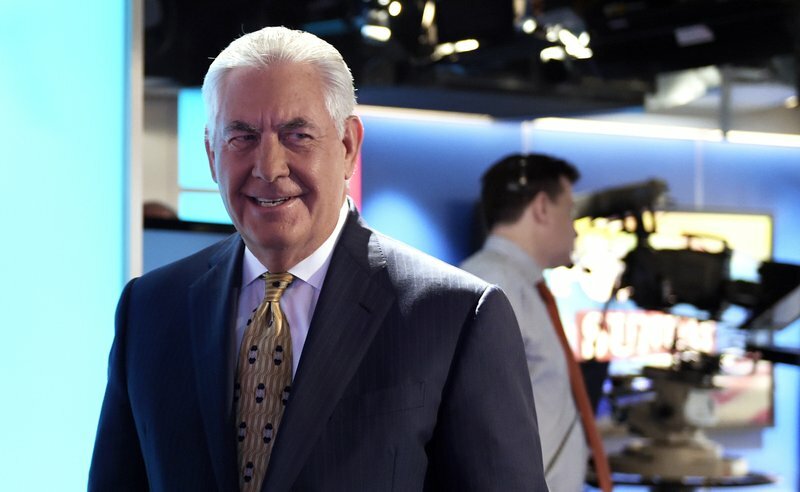 In the latest case, it was Globalist Secretary of State Rex Tillerson, who has either fallen victim to the media's ongoing spin in a rather dangerous spate of extreme naivete, especially for a sitting Secretary of State, or who has decided to isolate himself and commit what amounts to political suicide for the benefit of the cameras and the mass left-wing media. In this particular instance, it was the Associated Press, who with a few words, committed what could only be described as a deliberately egregious misrepresentation of what Trump had actually stated regarding the "Unite The Right" rally in Charlottesville. In fact, to this end, there was an array of groups at the event, from both the political Left and the political right, representing individuals who either believe that destroying historical monuments, on the one hand, is harmful to a nation, while on the other, there were also folks who believed that any monument representing the losing side in the Civil War, should not be glorified due to America's slave-holding past. Objectively speaking, a case could be made that both viewpoints are at the very least valid, at least as far as deeply held sentiments both for and against a certain historical viewpoint, goes. But, then what exactly did the president state that has been erroneously misrepresented on an ongoing basis, by both the media and certain members of Trump's cabinet? First, in the below panel taken straight from the AP story regarding Rex Tillerson, is the misrepresentation of Trump's words and it should be further mentioned that the gulf between what Trump stated and what the AP reported is quite considerable indeed, based on the implications of the misstated words as reported, along with the disparagement of the many groups who were actually in attendance, on both sides. 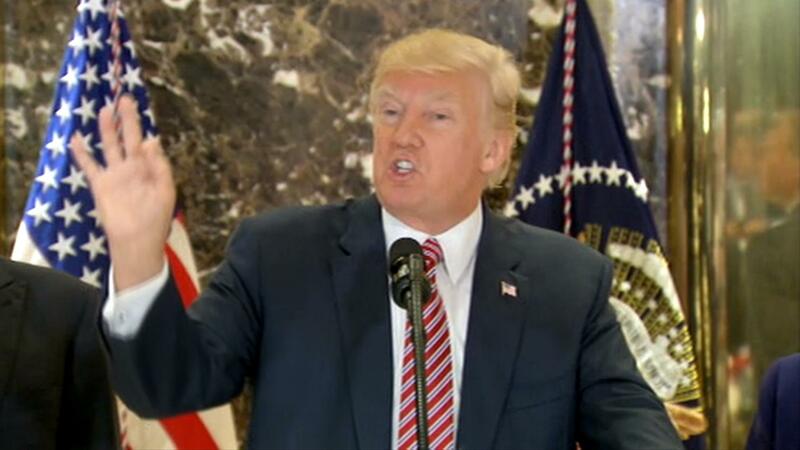 "Trump's handling of Charlottesville, in which he described people at a neo-Nazi rally as "very fine people." "Excuse me, they didn't put themselves down as neo-Nazi's and you had some very bad people in that group." "But, you also had people that were very fine people on both sides." "You had people in that group [pro-statue] that were there to protest the taking down of, to them, a very, very important statue and the renaming of a park from Robert E. Lee to another name. So, as can be seen below, the AP effectively over- generalized a very specific statement by Trump that actually meant something entirely different from what the AP and the media in general, are trying to sell. But, let's take it a step further as far as who these "very fine people" were, that Trump was referring to. The rally was initially billed as a "Unite the Right" rally meant to solidify political resistance to the taking down of historical US monuments. Further, the rally was never actually billed as a white supremacist/neo-Nazi rally, and we can only imagine how some of the groups that showed up actually felt when the white hoods and swastikas began appearing. Then you had the extreme-left Antifa movement, which consists primarily of a group of ultra-communist fascists who seem to believe that violence against any and all political viewpoints, other than their own, is the only way to fly. In fact, the mainstream media is already now coming to grips with the fact that the Antifa movement is far more violent than any of the other groups who attended. Plus, everyone knows the reputation of Black Lives Matter, whose slogan is one that disparages any notion of other groups that definitely also matter. Black Lives Matter has been at the heart of numerous riots and police-slayings including the unforgettable destructive riot in Ferguson, among others. So, while, conservative Americans might be getting a bit queasy at the mention of these just referenced left-wing groups, in attendance, the media in all its leftism, and for all intents and purposes, will probably find the mention of the other more traditional American groups, as outlined further above, to be as equally distasteful. Moreover, therein lies the rub, at least in part, regarding the fact that the media's singular inability towards adopting the traditionally expected objectivism that should be present within the 4th Estate, has for all intents and purposes been abandoned. This mainstream media tendency, now ever present, points explicitly to why the Associated Press should retract their entire story and come forward with the actual truth, as outlined and as can be seen and heard in the included Youtube video. What Trump actually stated was and is a far cry from what the AP actually reported and what Trump's Secretary of State wrongfully alluded to when he agreed with a media bent on taking down his boss. In addition to the AP retraction, Tillerson should resign, but only after he apologizes to both Trump and the America people, not only for being so pitifully outwitted by the opposition media but also for taking part in the complete mischaracterization of Trump's statements on Charlottesville. They can talk about Trump all that they want, however, no matter how an increasingly ultra-confused media tries to spin things, it's America's sand-bagging GOP-led Congress, rather than the President, which seems, at least to American voters, to be about as useful as chicken-poop on a pump handle-- but at least chicken poop can boast a genuinely recognizable, if not dynamic, identity. "You kids are probably saying to yourself, "Now, I'm gonna go out, and I'm gonna get the world by the tail and wrap it around and put it in my pocket!" Well, I'm here to tell you that you're probably gonna find out, as you go out there, that you're not gonna amount to jack squat!" While the biased and almost completely co-opted progressive media is not doing much better, at least as highly ill-trusted unpopular institutions go, it's still hard to imagine how a congressional body, as a whole, can be so hated by its very own voters, not to mention that of its opposition. Between the Dems and The GOP, they're like one big happy Manson family, and they just so happen to be one-third of our government. The Establishment Republican-led Congress, as led by Mitch McConnell, Paul Ryan, John Cornyn, and John Thune, seem more like Democrat-Globalist Cuckolds than Conservative leaders, and that's probably because most of them lie within the pockets of America's globalist Washington cartel on the one hand, and the semi-internationalist, open borders, anti-Trump Koch Brothers, on the other. Right now, for all intents and purposes, America's operating under one dual-purpose political party, the RepubliDems, and that should scare the hell out of all us, except that these guys can't even screw-up properly! These guys can't even lead from behind, indeed, when it comes to driving an agenda, the 115th congress makes the US Navy look like highly-skilled Formula One racers. "After all of the GOP’s legislative successes this year, this is the thanks he gets? "The man’s as popular in his home state as gonorrhea — if you trust PPP’s polling to be accurate, that is. Remember, they also had Jeff Flake polling in VD range in his own home state of Arizona. It’s unusual for an incumbent from a state dominated by his party to tank quite that badly absent a major scandal. But then, it’s also unusual for a party to tank quite as badly as the GOP has this year." "The relationship between President Trump and Senator Mitch McConnell, the majority leader, has disintegrated to the point that they have not spoken to each other in weeks, and Mr. McConnell has privately expressed uncertainty that Mr. Trump will be able to salvage his administration after a series of summer crises. What was once an uneasy governing alliance has curdled into a feud of mutual resentment and sometimes outright hostility, complicated by the position of Mr. McConnell’s wife, Elaine L. Chao, in Mr. Trump’s cabinet, according to more than a dozen people briefed on their imperiled partnership. Angry phone calls and private bad-mouthing have devolved into open conflict, with the president threatening to oppose Republican senators who cross him, and Mr. McConnell mobilizing to their defense." 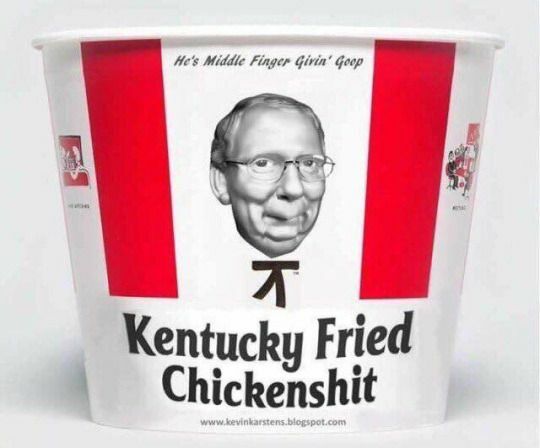 Plus, it was only a day or two ago that McConnell promised "there's zero chance' Congress will fail to raise the debt ceiling," to which we can only say rut-roh--because, this guy, Mitch "Full Repeal" McConnell, never met a promise he couldn't break, and regularly. I'd be embarrassed, were I him, but apparently, lying in DC and then, somehow, managing to get re-elected, appears to be a major resume' enhancement, at least inside the beltway. Oh, and why not add a little skullduggery in there to make it all complete. Now we have the Vice President, Mike Pence, a Koch Brothers' apparatchik, and a man who invariably looks as if he could break down and cry like a baby at any moment during underwhelming interviews, apparently has designs on a 2020 run against Trump, or who? Yeah, the guy who was nowhere near the presidency in 2016, at least not until Trump came along, is suddenly eyeing his boss's job....what the hell? "But with Trump’s approval rating falling to dangerous lows and fellow GOP leaders publicly opposing him more frequently than ever before, operatives on both sides have pointed to other Republicans’ activities as evidence of their interest in running. Pence has built up his political operation both inside and outside the White House, for example, and Kasich has refused to rule out the possibility of a run while loudly criticizing the president — though he has said he is not planning to take Trump on." In fact, we've been watching this particular story bouncing around the internet for the last couple of months, although many of us just can't believe that a so-called "honorable man" could be so publically disloyal that he falls within the realm of the worst kind of traitor. While many of us are still teetering on the edge of unbelief, it's becoming obvious that something's definitely up, with this particular story. In an unprecedented move earlier this year, Pence launched his own political-action committee, while also building relationships with top Republican donors. Pence’s team has repeatedly rebuked reports about his potential ambitions, but Democrats aren’t taking any chances: the D.N.C. is already digging into Pence’s record in preparation, as is the Democratic opposition super PAC American Bridge 21st Century." If this really does happen, it'll be fun turning Pence into finely ground sausage, throughout the campaign. 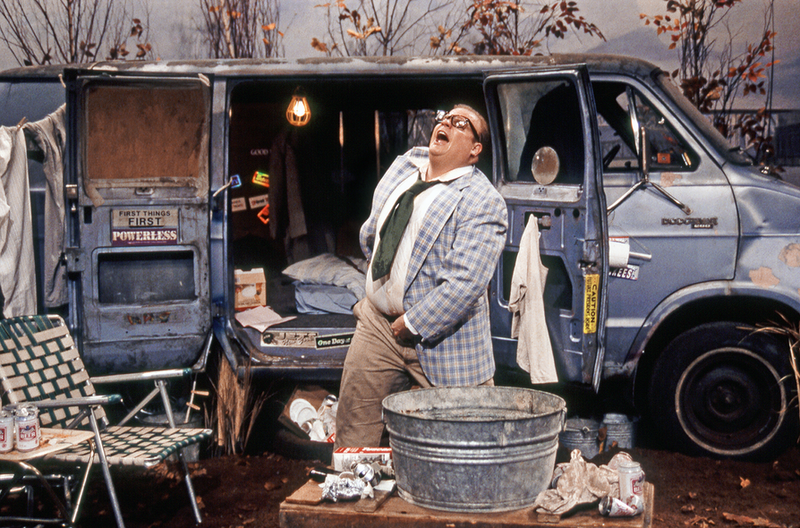 But, it has to be the trick of the year, watching the GOP Establishment political leadership, somehow, turning itself into sausage, and a very greasy sausage, at that.....with V.D. 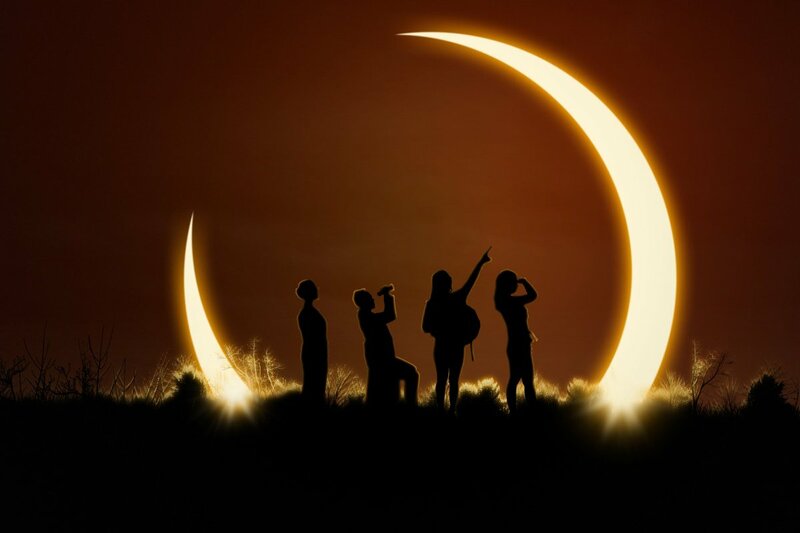 While many are near to bursting with excitement all across the US over the eclipse headed from coast to coast exactingly spanning America (only) on August 21st, others are not exactly so exuberant, and there's a particular reason for that. You see, America is still a predominantly Christian nation and with that bit of explanation comes a veritable panoply of scriptures and omens that might be indicating a time of extreme change and possibly even judgment, that may be pending directly upon America, from on high. In Biblical parlance, a solar eclipse represents a time of judgment and extreme change, for Gentile (non-Judaic) nations who witness its occurrence, and this is typically considered as a not so very good thing, in general. In fact, the last time a full solar eclipse occurred was 99 years ago, and shortly thereafter one of the worst pandemics ever recorded took out between 10% and 20% of the world's population. Known as the great Spanish Flu pandemic of 1918, just in America alone, an estimated 28% of the population became infected killing over 600,000 Americans--a death toll almost as great as that of the US Civil War, where 620,00 men lost their lives in the line of duty. But, there were also bright spots which occurred in 1918, as well, the biggest being the end of WW1 and the allied victory over Germany, which, unfortunately, set the stage for the war of all wars only to occur a scant 2o years later with Germany, again of course, but this time, as being led by a charismatic Nazi devil known as Adolph Hitler. Hitler went on to capture most of Europe before being driven back by Allied forces and the Soviet Union. However, there is also a geologically striking aspect to this eclipse that only a few know about, and the significance of this specific aspect lies along the exacting path that the eclipse will traverse across America. 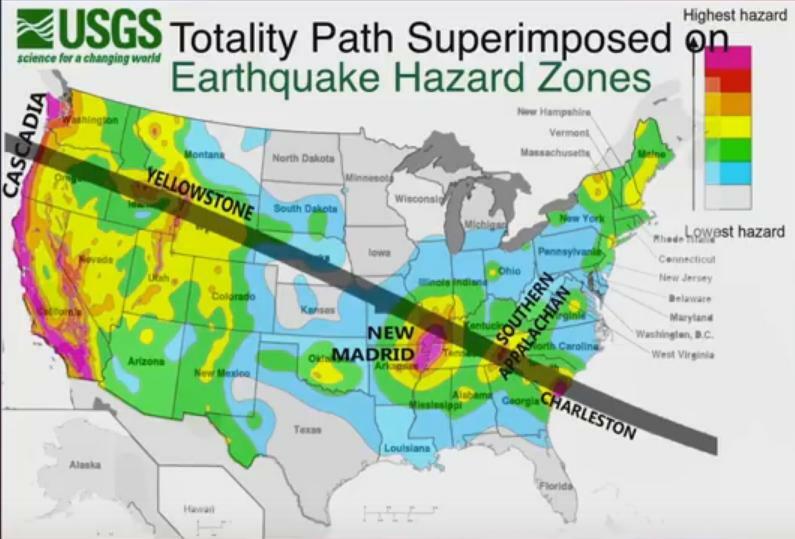 As can be seen in the above graphic, the path of the great 2017 solar eclipse traces its way through nearly every single major earthquake zone, in America; from the Cascadia zone in the Pacific Northwest, then through the Yellowstone zone which boasts a supervolcano which has been showing a striking amount of activity of late, then through the New Madrid Zone in the lower Midwest, and finally passing through the Southern Appalachian earthquake zone, in the Southeastern US. NSA McMaster A Soros Agent, Trump Scares Media on NK, Eclipse Omen? Do you think it possible that the creator might actually be trying to tell America something? But, finally, we have the following story from none other than the San Francisco Chronicle which describes the unusually large number of active volcanoes that may be foreshadowing California's physical secession from the rest of America, long before any threatened political secession can take place. In fact, according to SFGate, there are now 8 active volcanoes threatening to change life as we now know it, in California, alone. With the world's top volcanologists heading to Portland, Ore., on Aug. 14 for the first international volcanology assembly held in the U.S. since 1989, the many famous, prominent and dangerous volcanoes of the West Coast will be the subject of field trips and much discussion. Throughout the Cascade Range to southern California, the West Coast is home to most of the country's highest-threat volcanoes, as ranked by the United State Geological Survey. And California has its share. While Mount Shasta unsurprisingly tops USGS's list of very-high threat volcanoes in California, there are seven other volcanic areas in the state that are also young, nervy, jacked up on magma and "likely to erupt." Scientists know from geophysical and geochemical research that these volcanoes have molten rock, magma, "in their roots," said Margaret Mangan, Scientist-in-Charge at the California Volcano Observatory. "I call them the watch-list volcanoes." USGS caption: Volcanoes of very high to low threat are scattered throughout California, from the Oregon border (north) to Mexico (south). 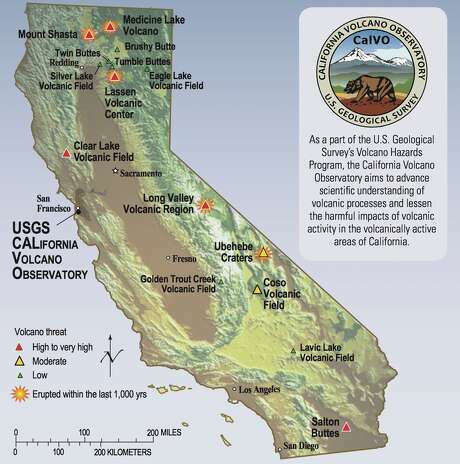 Other older volcanoes in California are of less concern. California’s volcano watch list is subject to change as new data on past eruptive activity are collected, as volcanic unrest changes, and as populations in threatened areas grow or decline. In 2005, a national team led by John Ewert, a volcanologist with the USGS Cascades Volcano Observatory, established a system for deciding which of the United States' 169 young volcanoes are the most dangerous and most in need of monitoring. In the "Framework for a National Volcano Early Warning System," Ewert's team identified 57 priority volcanoes in the U.S.
"We live on a fascinating planet," Ewert said of the likelihood of eruptions along the West Coast, "and one of the reasons it is fascinating is that it is dynamic. The entire surface of the Earth is in motion and sometimes people have a hard time wrapping their head around that. We have big earthquakes. We have volcanic eruptions, tsunamis. All these things happen." The volcano threat list was created, Ewertexplain, not simply to alert people that the Earth is petulant buttooset a foundation for determining which of the country's volcanoes need extensive monitoring. He said the team used 25 factors to determine a volcano's danger status: What has the volcano done in the past? What's its modus operandi? When does it tend to erupt? What kind of phenomenon does it produce? Lahars (mud slurries of ice, rocks and other debris)? Pyroclastic flows (hot gas,rock and other stuff out of the volcano)? Is it a highly explosive volcano? How active is the volcano right now? Are there seismic swarms? Is it emitting hot volcanic gases? Is the edifice changing its shape (deformation)? In addition to the geophysics of a volcano, the team examined how many people live or work near it, plus the amount and type of infrastructure have been built up around it ... power generation, port facilities, etc. The team also considered, What is the aviation exposure? How many flights a did day pass through the volcanic airspace? "If it is an explosive volcano," Ewert said, "we asked how close is it to an airport and what is the daily passenger load of the airport? Recall in 2010, the eruption of the Eyjafjallajökull in Iceland shut down European airspace for over a week. That ran up about a $10 billion impact cost. Given the fact that an explosive eruption can put an ash cloud up to cruise altitude in five minutes or less, that volcanic airspace is an important thing to take into consideration." Mangan said California had plenty to worry about in this regard as well. "Over the northern California volcanoes, the data from FAA suggests that there are a couple hundred jumbo jets on flight-lines that pass over those three volcanoes on a daily basis," she said. "And, likewise there are a couple hundred jumbo jets that are flying over Long Valley Volcanic Region as well." For all these reasons, Mangan said, the eight riskiest volcanoes in California need monitoring. "... so that we can forecast eruptions, essentially keep our finger on the pulse," she said. "The best network, the optimized network that we currently have, is in the Long Valley Volcanic Region. It is arguably one of the best in the nation. It is also one of the most restless volcanic areas currently." She added that the three Cascade Range volcanoes in northern California are being monitored to provide basic information, but the networks are not optimum. "So, we are working as we can, given funding levels, to modernize and upgrade the networks in northern California," she said. The other five "also have a way to go until we have an optimum monitoring situation." How dare they blame Trump and Conservatives for Charlottesville! After the entire Democrat party and President Obama, both, totally embraced the murderous rioters in Ferguson, Baltimore, Philadelphia, Milwaukee, and too many other cities too numerous to mention. The traditional media even saw fit to practically fall and its knees and pray to the demigods of Black Lives Matter, as life after life, both police, and civilians, were being lost and mayhem was being sewn, in the form of destruction of property and neighborhood businesses, all across America. And now, they dare blame Trump, when the shoe is on the other foot, tiny though it may be, in a diminutive little town in Virginia? Where is their logic and decency, if not rationality? If Trump were Obama, all things being equal, wouldn't he now be planning a meeting with the white nationalists and Ku Klux Klan members in the White House? Wouldn't the media, also, be applauding Trump for his racial heroism? Oh, he won't, don't worry, but Obama most assuredly did. Moreover, they keep telling us that there's no comparison here, and yet there seems to be nothing but similarities all across the board, unless, of course, someone is playing favorites based on something that happened nearly two centuries ago. Point in fact, are there any meaningful differences between the backward sentiments of black anti-nationalism/ supremacy and the equally backward sentiments of white nationalism /supremacy? The uber-racist/anti-cop “Black Lives Matter” militant movement pandered to the enabling of black racism against all other groups, as suckled at the teets of an engrossed media and the anti-capitalist Left, and that movement, now, is finding its inevitable backlash. But, that's not all, because meanwhile, in that same vein, the fascist anti-Fa movement is seeking to block all other opposition groups from voicing their opposing opinions by instituting violence against those same opposition groups, at almost every encounter. Oh, and by the way, isn't it the terrorist group ISIS that's vilified, by the media, for pulling down and destroying historical monuments all across the lands that they occupy? And excuse us, but history, is not a function of right or wrong, it simply "is," so why the preoccupation of destroying all vestiges of it? Doesn't that defeat the very purpose of remembering it, as actually happening, in the first place? Naturally, the political powers that be, as girded by the media, tend to only attack those who dwell outside of the strictures of political correctness and the thought police, whose goals tend to always run towards anarchy and revolt--and against law and order--unless of course, their ideological playthings appear to be at some form of risk. In Charlottesville Virginia, 3 people are now dead with numerous others wounded, as an initial result of the media and Democrat party's racial enabling of violence by the powers of the political Left in the 2014, 2015 & 2016 riots, including the vilification of others based only on their skin color's not being black. Point being that Newton's third law of physics states "with every action there is an equal and opposite reaction" and this law, probably better than any other oversimplification, best describes what is happening in small pockets across America. Humans, ladies, and gentlemen are subject to the same laws of physics, whether that law is being applied to a body in motion or an emotion in motion. While any truly thinking human realizes that all lives matter, regardless of melanin content, the widening racially motivated schism was created in an uber-Marxist attempt by the Progressives to exploit inequality as a burgeoning political brand. The media, while routinely slow on the analytical uptake, felt empowered enough to endorse the movement along with President Barack Obama, himself. Obama not only defended the racist black group, despite being responsible for numerous deaths and property losses reaching into the hundreds of millions, the media, and the entire political left reacted with cheers. The Democrat party even embraced the movement by allowing Black Lives Matters leaders take to the stage to address fellow Democrats. "The DNC joins with Americans across the country in affirming ‘Black lives matter’ and the ‘say her name’ efforts to make visible the pain of our fellow and sister Americans as they condemn extrajudicial killings of unarmed African American men, women and children," the solidarity resolution states. "The day after the resolution was passed, BLM activists in Minneapolis chanted, "pigs in a blanket, fry em' like bacon," as they marched down the street. This rhetoric also came just one day after the execution of Texas Sheriff Deputy Daron Goforth while he was filling up his patrol car at a local gas station. If you aren't familiar, "pigs in a blanket" refers to the bodies of dead police officers in body bags. " 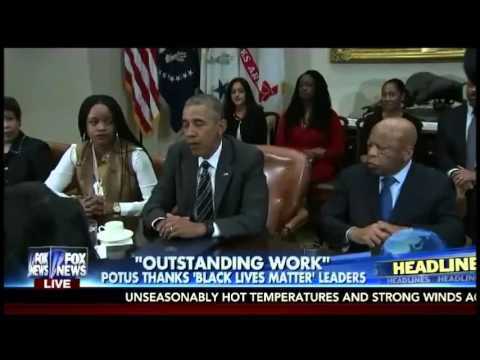 Now that the misguided endorsements have taken their inevitable turn, some equally misguided and rebellious whites have seen fit to make their own self-empowering statement as anti-powered by former president Barack Obama, who not only embraced the death and mayhem brought to America by the militant blacks, but defended it and even allowed a meeting with BLM leaders at the White House. So…..viola’…..the pestilence of racism that had eventually been mostly contained by our forebears, has now come roaring back at the behest of America’s weakest ex-President and media, the worst of both for a surety, in our long & storied history. So, let's be clear.....if Trump were to embrace the movement and meet with them in the White House, or if the Republican party began embracing white nationalism, even letting them up on the stage to tell us that "white lives only matter," then and only then can you anti-Trumpsters start pointing the finger. But, until that time just shut the hell up. America can see through you unscrupulous people in the media and the Washington political establishment, all too very clearly, and if you truly knew how you look to us within the optics you're constantly establishing, you certainly wouldn't be so smarmy..... "that, we can tell you."